Frustrated by his failures to cut the railroad lines to Atlanta, Sherman at the end of August 1864 decided to use most of his force to accomplish that goal. 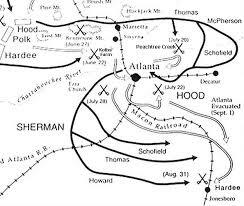 On August 25, Sherman marched six of his seven corps out of the siege lines of Atlanta and moved them south east to cut both the rail lines into Atlanta. Hood sent out Hardee with two corps to attempt to stop the Union movement. By the 28th the Union was in control of a section of West Point & Atlanta Railroad and Sherman’s men were busy destroying it. On the 30th, the Union corps closed in on Jonesborough, held by Hardee. Hardee launched an attack on the Union force on the morning of August 31, that was beaten back after hard fighting. Fearing a direct attack on Atlanta, Hood withdrew Stephen Lee’s corps from Hardee that evening. On September 1, 1864, Sherman attacked the heavily outnumbered Hardee at 4:00 PM. After tenacious fighting by the Confederates, the Union troops took Jonesborough and the last rail line into Atlanta. Atlanta was now untenable for the Confederates to hold.